Grow in a large pot in sunny, warm spots for maximum annual growth. Allow to die back each winter. Supplied in 1L pot approx 30cm tall as supplied. 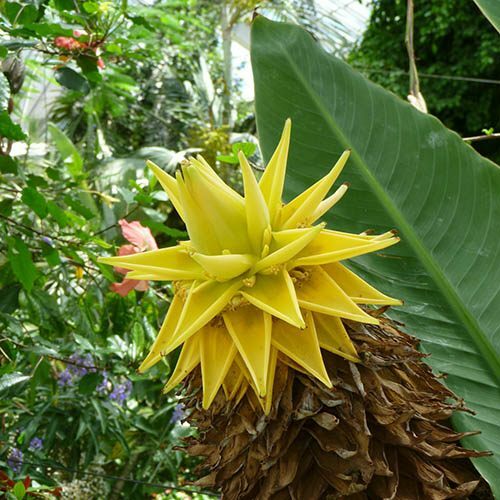 Without doubt, the toughest and hardiest of all ornamental bananas in the UK, it is grown for its dramatic and tough leaves, and, once mature, its amazing and long-lasting golden-yellow flowers - hence its name. From high up in the Chinese mountains of Yunnan, it is naturally very tough, and is exposed to temperatures well below freezing. It forms a much thicker and sturdier trunk-stem than other bananas, which is very tough and hardy. Even if leaves are damaged by frosts, more and new leaves emerge in spring, as well as numerous 'pups' round the side. The flower is in fact its last hurrah, as the 6 month epic flower display is a sign the plant will die - but fear not, you will have plenty of established pups round the side in a clump, each of which will grow and develop to maturity too. It is thus best regarded as a clump forming perennial. It is also much shorter and less vigorous than other huge banana plants too at around 4-5ft tall maximum, making it ideal for large pots in small gardens - grow in full sun or shade, it makes a great talking point. Note - it does not produce any edible banana fruit, or even tiny ornamental ones. Very easy to grow, and a great, exotic-looking patio focal point. Supplied as a well-established plant in a 1L pot, big stem and trunk formed, ready to pot on. Note - leaves may die back or turn brown in winter, but new ones will re-emerge in spring - the trunk at base is the key.